Street Plans Kicks off Complete Streets Projects in Lewiston-Auburn, Maine. The Androscoggin Valley Council of Government has retained Street Plans to work with two neighborhoring cities (Lewiston and Auburn) to develop a bicycle network plan, a complete streets best practices management guide, and to design a connection between Main Street in Lewiston and Simard Payne Park. 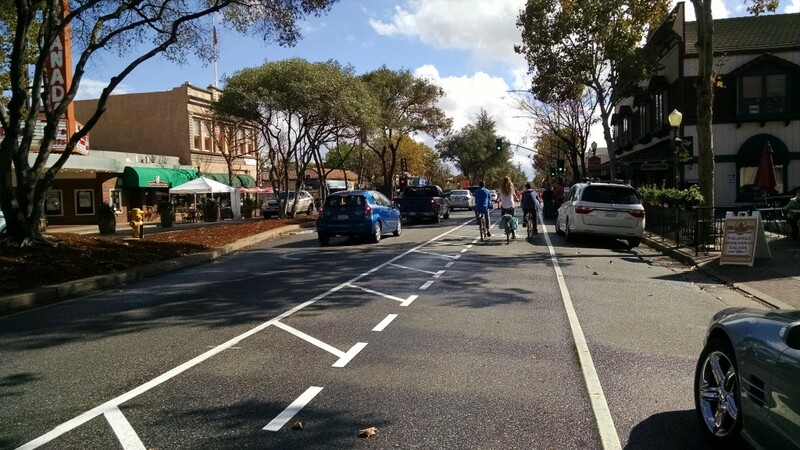 Street Plans leads Complete Streets Demonstration Project in Morgan Hill, California. Street Plans’ Julie Flynn is working with Alta Planning + Design, Harris Associates, and the City of Morgan Hill to develop a complete streets approach to the city’s main downtown artery, Monterey Street. Street Plans expertise in Tactical Urbanism was called upon to help the community and design team develop and implement a weekend long “right-sizing,” reducing the four lane thoroughfare to just two lanes, with wider sidewalks and buffered bicycle lanes. If the demonstration is a success, the City of Morgan Hill may move to further test the most successful aspect of the project before committing a much larger dollar amount for street reconstruction. With Melbourne-based CoDesign Studio, Street Plans Launches Tactical Urbanism Vol. 4. This past summer, Melbourne, Australia’s CoDesign Studio partnered up with Street Plans to research and write the 4th volume of the globally acclaimed Tactical Urbanism series. Focusing on examples in Australia and New Zealand, the guide explores nearly a dozen tactics implemented across a wide variety of contexts. Click here to download the publication now! Lydon Keynotes Walk 21 in Sydney, Australia. Principal Mike Lydon is in Melbourne, Sydney, and Christchurch, NZ for two weeks. While there he’ll help launch Volume 4 of the Tactical Urbanism series, facilitate a workshop with VicHealth and deliver keynote speeches at Walk 21, and with The Australian Heart Foundation. Lydon will also attend the International Congress on Adaptive Urbanism in Christchurch, New Zealand.